Ascending Butterfly: MOR Cosmetics Review and Giveaway! 3 Winners! This giveaway is now CLOSED. Thanks so much to our wonderful sponsor MOR Cosmetics, We look forward to working with you again! Congratulations to *'CherylS22', * 'Pat' and *'SkipTheLaundry' the confirmed winners of Ascending Butterfly's MOR Cosmetics Giveaway! *We post our winner's username/comment name instead of full name. Remember: There are still some great giveaways active on the upper right hand side of the page! Ƹ̵̡Ӝ̵̨̄Ʒ - My running theme this week has stemmed from a burning desire to escape the bitter cold, snowy and icy' not-so-wonderland' that is New York this week! With technology challenges that include my laptop being in the shop for repair and spotty connections with my ISP, my daydreams of warm, sun-drenched and sandy beaches are pretty much all consuming at this point. And then along comes my friends at MOR Cosmetics to the rescue! While they didn't send me on the caribbean vacay of my dreams, they did the next best thing to it, they sent me some goodies to try out that transported me with a sensory delight of aromatherapy that nearly did take me to the tropics! MOR is a line of divinely inspired skincare, spa and body products that draws inspiration from the far corners of the globe. It was during a trip to India in 2001 to source fabrics for their homeware line that Melbourne based founders Dianna Burmas and Deon Iuretigh fell in love with the endless possibilities of blending traditional and contemporary ingredients to create an array of fragrances and beauty products. Deciding to channel all their energies into a new line of body products, they created MOR Cosmetics. With over 350 products today, the line has a cult like following and is sold in some of the world's hippest boutiques. Mor offers a range of products from bath oils and foams, body wash and scrubs, soothing massage oils, richly emollient hand and body creams, and lovely soaps and candles. 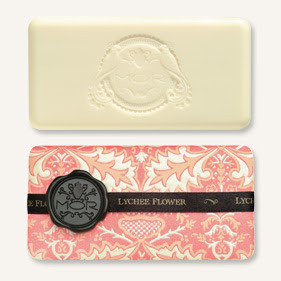 I tried out the Lychee Flower Soap, it's a MOR Cosmetics best-seller and for very good reason, the scent is hypnotic, and it instantly conjures up images of a warm beach, flowers in your hair and the sun on your skin, yes folks, it's THAT good! And don't get me started on the packaging! It's so beautiful that it took me forever to open it because I didn't want to destroy the paper! But I know I have to do the 'hard' stuff so you don't have to, and while I did open it very carefully, the scent permeated the air in the bathroom in such a way that it rivals some of the finest candles I've purchased! These are stunners, perfect to display in your powder room and your guest bathroom as well. (Why do guests always get the good stuff?) These are also fabulous hostess gifts! I also had the pleasure of trying out the Snow Gardenia Body Butter. I am pretty picky when it comes to my body butters. I like them to be rich (not too thick, no too thin), to be super-hydrating (especially in winter since it's so cold and windy here that the weather tends to dry out my skin) and I like scent, I like to know it's there (not too much as to offend the 'noses' working around me but enough to know I have something special on!) and I am pleased to report, Mor definitely exceeded my body butter expectations. And that's not so easy to do! Again, note the beautiful packaging! It's already ready for gift giving! Gentlemen take note, that special lady in your life will absolutely LOVE this! This is vanity worthy packaging for sure. Don't you just love the silk damask inspired packaging? How to Win: (1) You must be a PUBLIC follower of Ascending Butterfly to be eligible for this and all giveaways. Indicate in your entry that you follow (if your 'comment name/user id' differs from your profile id, please let me know what name you follow under) and (2) Visit Mor Cosmetics and pick another soap (other than the one being reviewed and given away!) that you like and leave the LINK to that soap in your comment entry! (3) You must also leave your email address somewhere in your comment. (You can format it this way for security, example: ascendingbutterfly AT mail host DOT com). (If your email is clearly visible in your profile, you can just say so, that's OK!) Please follow the easy 1, 2, 3 steps to winning! This giveaway is open to USA residents who are 18 years of age or older. Ƹ̵̡Ӝ̵̨̄Ʒ - NEW METHOD OF EXTRA CREDIT, Ascending Butterfly is a nominee for the Bloggers Choice ’10 Awards in the ‘Best Blog About Stuff’ Category - http://bloggerschoiceawards.com/ You can press the button below to go straight to the page where Ascending Butterfly has been nominated! FTC Disclosure Info for this Giveaway: This is not a paid insertion. This is a non-compensated post and all opinions regarding the product are expressly my own experiences. I was provided product to review and the sponsor is also fulfilling product to prize winner(s), this in no way influenced my opinion of my experiences with this product. I voted for Ascending Butterfly on Fuel My Blog! I think the Fin de Sicle Soap sounds cool!!! I am a public follower! Love your blog. I follow MOR Cosmetics on facebook as Lisa Selmon Vance.. and I commented. I tried to copy and cut the link twice for the orange blossom soap but it will not let me. Anyway I like the orange blosoom soap from MOR. I became a fan of Mor Cosmetics on FB and wrote on the wall that you sent me. I follow Ascending Butterfly on networked blogs. I follow on Google and I think that the Marshmallow scent sounds FUN! I'd also love the fin de siecle soap as well. I am a public follower on google connect. h mcnaron at g mail dot com. Ascending Butterfly Fan on Facebook! I follow Mor Cosmetics on twitter @Aerated. The Indian Pomelo soap looks really nice! I like the fruit of cornucopia. Ooops..trigger finger! Forgot my soaps link! Following MOR cosmetics on Twitter. I'd also love to try the Italian Blood Orange Soap. I became a FB fan of MOR cosmetics & posted a note on the wall.